Concept albums can do interesting things and be lots of fun if the idea is right. The piano duo ZOFO, who we have covered before here, had a great idea and made it work. 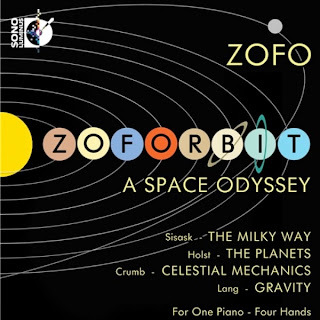 The album is called ZOFORBIT: A Space Odyssey (Sono Luminus 92178). It is a logical grouping of four compositions for piano, four hands, with the theme of space, the universe, the cosmos. They've come up with four compositions that all address such themes, some well-known, some lesser-known, but all near-perfect for the duo. Holst's "The Planets" sounds wonderful in a duo arrangement, then there is George Crumb's "Celestial Mechanics" from "Makrokosmos IV". David Lang gets a say with the brief "Gravity" and finally the least known of the four works/composers but a good addition nonetheless, Urmas Sisask (b. 1960) and "The Milky Way". ZOFO is Eva-Maria Zimmermann and Keisuke Nakagoshi. They combine a very together simpatico duo dynamic with a real sense of fun. The album as is usually the case on Sono Luminus comes in a set as a standard stereo CD and a Blu-Ray DVD with a 5:1 surround mix. 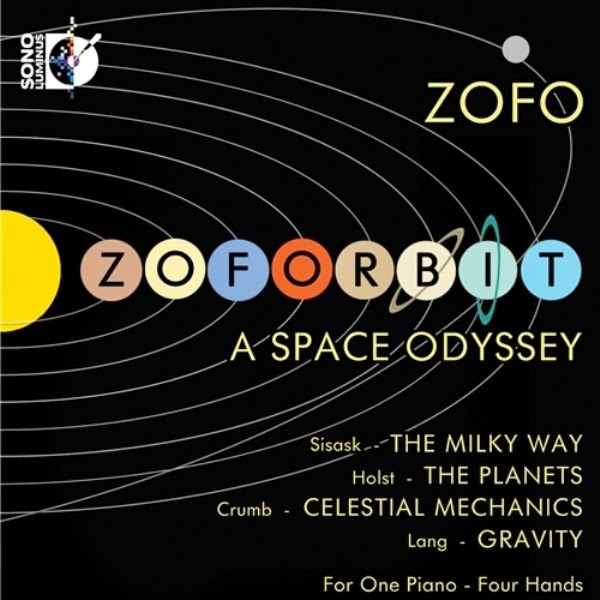 "The Planets" in a four-hand piano version has a kind of revelatory quality. All the notes are there (all the necessary ones) and it sounds so idiomatic and modern in an all-piano zone that it's like hearing it anew all over again. The rendition forms a definite high-water mark that will please just about anybody. The Crumb work is given all the cosmic spatiality it deserves. The Lang has a pleasing contemplative quality. And then the surprise of the set is Sisask's "The Milky Way" subtitled "Piano Sonata op. 24 for Four Hands". It has ritual rhythmic movement in an exotic minor mode, greatly abetted by the passages where the strings are dampened or strummed. It almost sounds like gamelan music, only more cosmic. So here we have what is a real treat. . . . something in the outer zone, eminently suited for those evenings when you don the silver space outfit, get out the Tang and head for realms unknown and far away. If there is hope for the younger generation taking to modern classical, ZOFO has found a way--making it fun! Give it to your teenager or budding toddler, even. A delight!